When the floor in your London home is dull and lacklustre you can return it to sparkling good looks and a healthy shine by a little rejuvenation in the form of scraping off the old veneer, sanding the boards and reapplying a fresh coat of finishing. There are a high percentage of homes in the London area fortunate enough to have been built with original hardwood flooring which is still in place today. If you are lucky enough to have uncovered such a real wood gem under piles of old carpet or lino, then you may be surprised to learn that it doesn’t have to cost a fortune to restore your floor to mint condition. In fact, you may be able to do it yourself if you have time to invest, basic hands-on carpentry skills and are not afraid of a little elbow grease and some hard work. If, after reading this article, you would love to have your floor restored and looking the way it should but are unable to take on the task yourself then it would be wise to call in some London floor sanding experts for a no-obligation quotation. This gives you an accurate assessment of the floor as it currently stands without the obligation to start the process. Empty the room completely. If you have small children or members of the family who are asthmatic then it would be wise for them to be elsewhere when the sanding commences. Seal up doors you won’t need to use and other interior doors in the house. Start by sweeping the floor vigorously, dislodging dust particles lodged between the boards and in the corners followed by a light vacuum and damp mopping. Use the hammer to extract any broken or protruding nail heads. Check for enlarging gaps between the boards as these will cause squeaking and draughts if left unattended. Fill gaps as appropriate with filler and level off with spatula. Wipe away residual filler and any spillage. 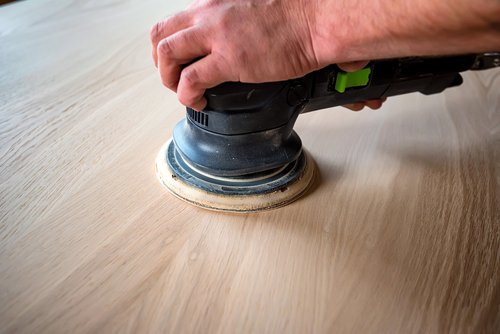 Get your sander ready by fitting a coarse grade of paper to the sanding plate and carefully walk the machine along the floor boards at an even pace. When stationary, switch off the machine every time as to leave it on idle will cause ruts and deep grooves in the wood. The large sander will be unable to get in flush to the skirting and corner, so these areas you will have to sand by hand. When the first sanding is complete again vacuum the room thoroughly, change the paper for a finer grain and repeat the process. There is no need to hurry the process as it is exacting work which, if rushed, tends to result in a botched job. Take your industrial sander on a two-day hire so you do not feel pressured to finish the sanding in one day. Depending upon the condition of the floor you will need two or three sandings, each time change the paper to one of a finer grain. You will know when the floor has been adequately sanded as it will be smooth enough to walk on comfortably with bare feet and will be a few shades lighter in colour than it was at the start. When the final sanding has been completed, vacuum again and use a lightly damp mop along the grain of the wood. Now you can apply the finishing. Whether you choose varnish, oil or stain make sure you apply exactly as per instructions, leaving enough drying time and with a free flow of air throughout the room as you work.